THE BESTSELLING FANTASY SERIES EVERYONE'S TALKING ABOUT... Over 3 million copies sold! What happens when WITCHES meet VAMPIRES? For fans of Harry Potter, Twilight, The Vampire Diaries and True Blood, prepare to be transported to the breathtaking new world of The Shade... Over 16,450 Five-Star Reviews (on Amazon/Goodreads). "A new spin on a crowded genre. Unique, passionate, thrilling." - Faerie Tale Books ★★★★★ "...an utterly enthralling, highly exciting and beautifully sensitive story. Five stars and a standing ovation." - Books For Tomorrow ★★★★★ Wall Street Journal Best-Seller. Recommended Read on USATODAY.com. Amazon Overall Top 3 Best-Seller. #1 Best-Seller in Vampire Romance, Paranormal & Fantasy. _____________________________________________________ On the evening of Sofia Claremont's seventeenth birthday, she is sucked into a nightmare from which she cannot wake. A quiet evening walk along a beach brings her face to face with a dangerous pale creature that craves much more than her blood. She is kidnapped to The Shade, an enchanted island where the sun is eternally forbidden to shine. An island uncharted by any map and ruled by the most powerful vampire coven on the planet. She wakes here as a slave, a captive in chains. Sofia's life takes a thrilling and terrifying turn when she is selected out of hundreds of girls to take up residence in the tree-top harem of Derek Novak, the dark royal prince. Despite his addiction to power and obsessive thirst for her blood, Sofia soon realizes that the safest place on the island is within his quarters, and she must do all within her power to win him over if she is to survive even one more night. Will she succeed? Or is she destined to the same fate that all other girls have met at the hands of the Novaks? Scroll up & click the buy button now to find out... "I challenge you to read this book and not love it." - Get Lost In Fiction ★★★★★ _____________________________________________________ Note: Derek Novak and Sofia Claremont's story is only a 7 book series. It completes in Book 7: A Break of Day, and the characters embark on entirely new adventures from Book 8: A Shade of Novak. 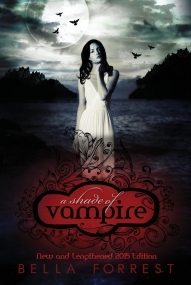 I wasn’t sure what to expect when I first sat down to read Bella Forest’s A Shade of Vampire. I was certainly a Twilight fan, at least for the short few weeks that it took me to rip through all four books. Edward Cullen had me under his spell just as surely as he did Bella Swan (and most of the female population of YA readers). I was told I would like this new series even better, so I thought a similar experience was in order. I couldn’t have been more mistaken, and I was pleasantly surprised. Forest takes some great risks, allowing for an unpredictable, more daring story. First of all, these vampires are not vegetarians. Not by a long shot. Main character Sophia Claremont is drugged and abducted very early on, then taken to their lair for the sole purpose of first serving in a harem, and later being eaten. Not one of the vampires comes across as alluring, though most of them are beautiful and fabulously dressed. They’re completely dismissive, even hateful, towards the lowly humans. A war seems to be raging between vampires and humans—especially those referred to as “hunters”—and the undead hide out on their own island, under a veil of permanent darkness and served by countless human slaves. “Welcome to The Shade,” Sophia is told. There doesn’t seem to be much hope of escape. The other main character and probable love interest is Derek Novak, prince of The Shade. He’s been in an unnatural sleep for four hundred years, and he wakes suffering from ravenous hunger. He’s offered Sophia (and several more abducted teenage beauties), and very nearly devours her. Somehow, for reasons no one can understand, she calms him and he is able to control his hunger. We get hints of some prophecy fulfilled from Derek’s sister, The Shade’s seer Vivienne. Derek is smitten from this point on, but not so Sophia. She misses her home and her best friend Ben, and she’s terrified of the vampires. Derek starts to grow on her a bit by the end, but she paints a realistic view of how any young woman might actually feel toward a man who drinks a glass of blood at the breakfast table while she’s choking down her toast. She’s not throwing herself into his arms and begging to be turned into a demon, and we get that. Derek’s fascination with her, however, is much less understandable. From the beginning of the book, Sophia presents herself as a rather weak character. She suffers from panic attacks, is secretly in love with her best friend who won’t give her the time of day, and comes across as a mousey nobody. A few Easter Eggs are dropped here and there, which suggest that Sophia is somehow special, but it’s almost like she has a disability that is hard to diagnose. My hope is that something in her past (which is shadowy), or maybe her genetic code, is discovered later which makes her more interesting.